Marketing automation platforms (MAPs) help to identify, qualify, convert, and grow customers. It does this by enabling marketers to define rules and processes by which to engage customers at greater scale and with greater relevance, driving a demand generation overall strategy. Marketers using marketing automation are substantially increasing key metrics like demand generation, leads, conversions, and revenue. We find in our own research that 80% of MAP users see their leads increase, and 77% see conversions increase. 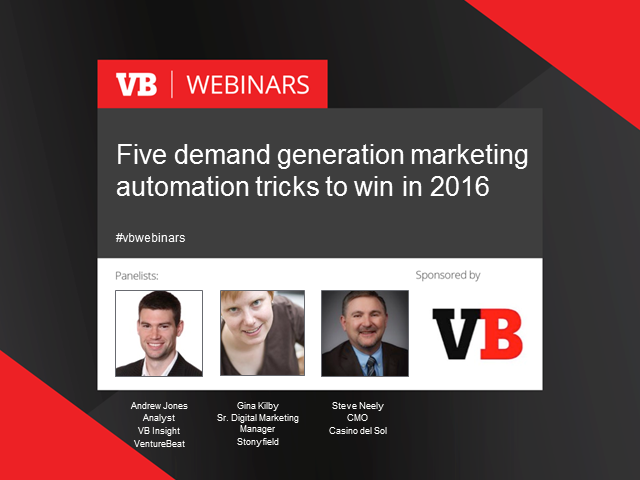 Yet only a fraction of businesses are using marketing automation for demand generation today. Why? First and foremost, it’s hard to choose: The top challenge in vendor-selection is simply understanding the differences in functionality between them. Not only are there more vendors than ever, but more features. MAPs are made up of many different feature-sets. Implementation is also a challenge. Nearly three in four MAP users said they had issues or delays in getting results. This webinar is based on data from 243 marketing automation users. The findings cover features, pricing, and services for 24 of the top vendors. We also conducted dozens of interviews and incorporated market share close to 20 million websites. This webinar will be based on Andrew Jones' VB Insight report, refreshed in December 2015.